I’ve become slightly obsessed with urban trail running over the last decade. It’s become an essential part of my training routine and revitalized my love of running. 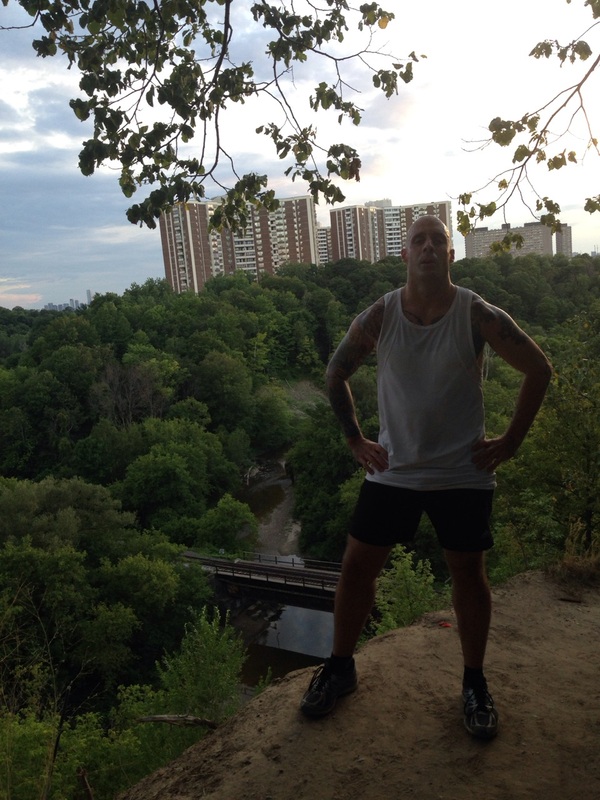 I live in the east end of Toronto, and my love of trail running is inseparable from my passion for East York and Scarborough’s tragically underappreciated and underutilized urban green space, by which I am mainly referring to the Don River area. Starting in Scarborough, you can run or cycle from Warden and St. Clair all the way to Lawrence and Yonge in North York almost without touching concrete at all. The neglect of the east end’s impressive green space is partly because this is a working-class part of town where most people are busy, well, working (I once ran in the Bridle Path on a weekday and it was full of soccer moms walking their golden retrievers). The fact that the east end has a reputation (largely unfair, in my humble opinion) as a bad part of town probably doesn’t help. Above: the entrance to Taylor Creek from Cullen Bryant Park, early winter. On my east side trail runs I’ve met deer, groundhogs, rabbits, turtles, snakes, rare birds and strange beetles. I’ve also stumbled upon numerous homeless encampments, including one fellow whose been living in the Don Valley for a decade in a hand-made cabin fully equipped with solar panels and a generator. It’s all part of the adventure of trail running in the east end. What are the benefits of trail running? It is less impactful on your ankles, knees, shins, and hips than running on concrete. It is a much more comprehensive workout, especially for your lower body and core, providing a greater balance of aerobic and anaerobic exercise and building muscles that get ignored while running on flat ground. Getting out of the city and traffic, running and sweating in the midst of nature, encountering wild animals – it’s good for the soul. Nothing helps me decompress, clear my mind and shake off something that’s been bothering me, like a good trail run on a beautiful day. While running on flat ground and especially a track you can practically do blindfolded, trail running is a mental workout as well. You must constantly pay attention to your surroundings as you navigate the trails and avoid obstacles. This stimulates the brain and builds agility and reflexes. Because of the constant mental stimulation involved in trail running, your mind doesn’t have time to think about how tired or sore or bored you might be, as often happens running on familiar streets, a track or a treadmill. In other words, the mental stimulation involved in trail running works against both boredom and fatigue, so you enjoy yourself more and perform better. Running through the woods, ducking branches, hopping over logs, creeping across sketchy bridges, scaling hills – you feel like a friggin’ ninja. And who doesn’t think ninjas are cool? Safety over speed. It is easy to injure yourself trail running, primarily because there are constant tripping hazards. Pay attention to where your feet are landing, and slow down or walk when you have to. Sketchy bridges built my mountain bikers or hillbillies are fun, but they can be dangerous! If you’re running with others, cross bridges one at a time. Listening to music on headphones is a bad idea. It prevents you from fully appreciating the beauty of your environment, but more importantly it impedes awareness of your surroundings and makes it real easy to collide with a mountain biker coming from behind or speeding around a sharp bend. Next Roman Gonzalez: Sandinista champion? A cabin in the Don? Where abouts? Unfortunately I am not at liberty to say. But the gentlemen who lives there is very friendly and easy enough to meet in Taylor Creek year round. Assuming thats you in the picture – What workout and other exercise do you do, man? Reblogged this on Radical Movement.